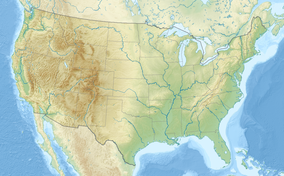 This article is about the national park in the southwestern United States. For the canyon itself, see Grand Canyon. Grand Canyon National Park, located in northwestern Arizona, is the 15th site in the United States to have been named a national park. The park's central feature is the Grand Canyon, a gorge of the Colorado River, which is often considered one of the Wonders of the World. The park, which covers 1,217,262 acres (1,901.972 sq mi; 4,926.08 km2) of unincorporated area in Coconino and Mohave counties, received more than six million recreational visitors in 2017, which is the second highest count of all American national parks after Great Smoky Mountains National Park. The Grand Canyon was designated a World Heritage Site by UNESCO in 1979. The park celebrated is 100th anniversary on February 26, 2019. "Grand Canyon" was officially designated a national park on February 26, 1919, though the landmark had been well known to Americans for over thirty years prior. In 1903, President Theodore Roosevelt visited the site and said: "The Grand Canyon fills me with awe. It is beyond comparison—beyond description; absolutely unparalleled through-out the wide world... Let this great wonder of nature remain as it now is. Do nothing to mar its grandeur, sublimity and loveliness. You cannot improve on it. But what you can do is to keep it for your children, your children's children, and all who come after you, as the one great sight which every American should see." Despite Roosevelt's enthusiasm and strong interest in preserving land for public use, the Grand Canyon was not immediately designated as a national park. The first bill to establish Grand Canyon National Park was introduced in 1882 by then-Senator Benjamin Harrison, which would have established Grand Canyon as the third national park in the United States, after Yellowstone and Mackinac. Harrison unsuccessfully reintroduced his bill in 1883 and 1886; after his election to the presidency, he established the Grand Canyon Forest Reserve in 1893. Theodore Roosevelt created the Grand Canyon Game Preserve by proclamation on 28 November 1906, and the Grand Canyon National Monument in 1908. Further Senate bills to establish the site as a national park were introduced and defeated in 1910 and 1911, before the Grand Canyon National Park Act was finally signed by President Woodrow Wilson in 1919. The National Park Service, established in 1916, assumed administration of the park. The creation of the park was an early success of the conservation movement. Its national park status may have helped thwart proposals to dam the Colorado River within its boundaries. (Later, the Glen Canyon Dam would be built upriver.) In 1975, the former Marble Canyon National Monument, which followed the Colorado River northeast from the Grand Canyon to Lee's Ferry, was made part of Grand Canyon National Park. In 1979, UNESCO declared the park a World Heritage Site. The 1987 the National Parks Overflights Act found that "Noise associated with aircraft overflights at the Grand Canyon National Park is causing a significant adverse effect on the natural quiet and experience of the park and current aircraft operations at the Grand Canyon National Park have raised serious concerns regarding public safety, including concerns regarding the safety of park users." In 2010, Grand Canyon National Park was honored with its own coin under the America the Beautiful Quarters program. The Grand Canyon, including its extensive system of tributary canyons, is valued for its combination of size, depth, and exposed layers of colorful rocks dating back to Precambrian times. The canyon itself was created by the incision of the Colorado River and its tributaries after the Colorado Plateau was uplifted, causing the Colorado River system to develop along its present path. The primary public areas of the park are the South and North Rims, and adjacent areas of the canyon itself. The rest of the park is extremely rugged and remote, although many places are accessible by pack trail and backcountry roads. The South Rim is more accessible than the North Rim, and accounts for 90% of park visitation. The park headquarters are at Grand Canyon Village, not far from the south entrance to the park, near one of the most popular viewpoints. Most visitors to the park come to the South Rim, arriving on Arizona State Route 64. The highway enters the park through the South Entrance, near Tusayan, Arizona, and heads eastward, leaving the park through the East Entrance. Interstate 40 provides access to the area from the south. From the north, U.S. Route 89 connects Utah, Colorado, and the North Rim to the South Rim. Overall, some 30 miles of the South Rim are accessible by road. Grand Canyon Village is the primary visitor services area in the park. It is a full-service community, including lodging, fuel, food, souvenirs, a hospital, churches, and access to trails and guided walks and talks. Several lodging facilities are available along the South Rim. Hotels and other lodging include: El Tovar, Bright Angel Lodge, Kachina Lodge, Thunderbird Lodge, and Maswik Lodge, all of which are located in the village area, and Phantom Ranch, located on the canyon floor. There is also an RV Park named Trailer Village. All of these facilities are managed by Xanterra Parks & Resorts, while the Yavapai Lodge (also in the village area) is managed by Delaware North. On the North Rim there is the historic Grand Canyon Lodge managed by Forever Resorts and a campground near the lodge, managed by the national park staff. Grand Canyon National Park has a BSk (Köppen climate classification) - tropical and subtropical steppe type of climate consisting of dry, hot summers and cold winters. On the North Rim there are few roads, however, there are some notable vehicle accessible lookout points including Point Imperial, Roosevelt Point, and Cape Royal. Mule rides are also available that go to a variety of places including several thousand feet down into the canyon. Many visitors to the North Rim choose to make use of the variety of hiking trails including the Widforss Trail, Uncle Jim's Trail, the Transept Trail, and the North Kaibab Trail, the latter of which can be followed all the way down to the Colorado River, and to across to the South Kaibab Trail and the Bright Angel Trail, which continue up to the South Rim of the Grand Canyon. The Toroweap Overlook is located in the western part of the park on the North Rim. Access is via unpaved roads off Route 389 west of Fredonia, Arizona. The roads lead through Grand Canyon-Parashant National Monument and to the overlook. A variety of activities at the South Rim cater to park visitors. A driving tour (35 miles (56 km)) along the South Rim is split into two segments. The western drive to Hermit's Point is 8 miles (13 km) with several overlooks along the way, including Mohave Point, Hopi Point, and the Powell Memorial. From March to December, access to Hermit's Rest is restricted to the free shuttle provided by the Park Service. The eastern portion to Desert View is 25 miles (40 km), and is open to private vehicles year round. Walking tours include the Rim Trail, which runs west from the Pipe Creek viewpoint for about 8 miles (13 km) of paved road, followed by 7 miles (11 km) unpaved to Hermit's Rest. Hikes can begin almost anywhere along this trail, and a shuttle can return hikers to their point of origin. Mather Point, the first view most people reach when entering from the South Entrance, is a popular place to begin. Private canyon flyovers are provided by helicopters and small airplanes out of Las Vegas, Phoenix, and Grand Canyon National Park Airport. Due to a crash in the 1990s, scenic flights are no longer allowed to fly within 1,500 feet (460 m) of the rim within the Grand Canyon National Park. Flights within the canyon are still available outside of park boundaries. The US government had halted development of a 1.6 million acres area including the national park from 1966 to 2009, during the Bennett Freeze, because of an ownership dispute between Hopi and Navajo. The Grand Canyon Association (GCA) is the National Park Service's official nonprofit partner. It raises private funds to benefit Grand Canyon National Park by operating retail shops and visitor centers within the park, and providing educational opportunities about the natural and cultural history of the region. ^ "Grand Canyon National Park Visitor Center". Geographic Names Information System. United States Geological Survey. Retrieved 2011-08-14. ^ "Grand Canyon Centennial History". TIME. Retrieved 19 April 2019. ^ Yanagihara, Wendy; Denniston, Jennifer (2008). Grand Canyon National Park. Lonely Planet. p. 95. ISBN 1741044839. ^ Anderson, Michael F. "Polishing the Jewel: An Administrative History of Grand Canyon National Park" (PDF). Grand Canyon Association. Retrieved 7 December 2015. ^ Pryputniewicz, Vanya; Peterson, Peter. "Grand Canyon National Park Presents Living History Performance of President Theodore Roosevelt". nps.gov. Retrieved 27 February 2015. ^ "Grand Canyon Coin Introduced" (PDF). United States Mint. 2010. Retrieved 27 February 2015. The Grand Canyon National Park Quarter is the fourth coin of 2010 in the America the Beautiful Quarters® Program. The reverse image features a view of the granaries above the Nankoweap Delta in Marble Canyon near the Colorado River. ^ a b "North Rim". Grand Canyon National Park. National Park Service. Retrieved 18 November 2018. ^ Rand McNally (2010). Road Atlas. United States, Canada, Mexico. ^ a b National Park Service (1972). South Rim. Grand Canyon National Park, Arizona: US Government Printing Office. ^ a b "Lodging". National Park Service. Retrieved 7 December 2015. ^ "Campgrounds - North Rim". National Park Service. Retrieved 7 December 2015. ^ a b "Grand Canyon National Park, Arizona, USA - Monthly weather forecast and Climate data". Weather Atlas. Retrieved 26 January 2019. ^ Grand Canyon West. "Grand Canyon Helicopter & Aerial Tours". ^ Kate Linthicum (November 5, 2009). "Trying to be rebuild after 40 frozen years". Retrieved 5 March 2015. Public domain images from the National Park Service. This page is based on the Wikipedia article Grand Canyon National Park; it is used under the Creative Commons Attribution-ShareAlike 3.0 Unported License (CC-BY-SA). You may redistribute it, verbatim or modified, providing that you comply with the terms of the CC-BY-SA.